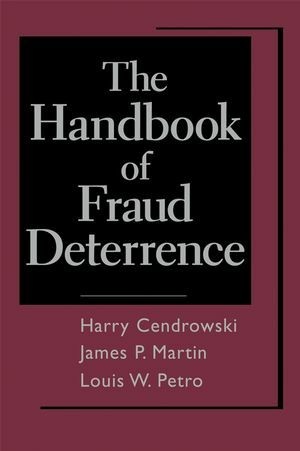 The Handbook of Fraud Deterrence encompasses the applicable professional standards and common applications for forensic accounting, fraud deterrence, and fraud investigation services. It is the first book that explains fraud deterrence through internal control improvement within the structure of forensic accounting procedures. Harry Cendrowski, a frequent speaker on forensic accounting and litigation, is author of NACVA training programs and many journal articles. He is President of Cendrowski Corporate Advisors that produces two newsletters on fraud: The Fraud Files and Corporate Governance Edition. James Martin is frequent contributor to Fraud Files and Corporate Governance Edition newsletters, and is author of journal articles and NACVA training programs on forensic accounting. Louis Petro, Ph.D., has contributed to Wiley business publications and has authored books and written journal articles. He is a Professor at the University of Windsor and a CPA. PROFESSIONAL ENVIRONMENT OF FRAUD DETERRENCE. 1 Fraud Deterrence as a Business Management Tool. Motivations for Process Improvement and Monitoring. Importance of Internal Controls in Dynamic External Environments. Environmental Change and Its Effect on the Fraud Triangle. Where Is Bedrock for Fraud Deterrence? 2 Definition of Fraud Deterrence. Deterrence Activities Will Affect Control Culture. 3 History of Fraud Deterrence. 4 The Role of Professional Standards. American Institute of Certified Public Accountants Auditing Standards. Institute of Internal Auditors Standards. Association of Certified Fraud Examiners Standards. The Fraud Triangle and Financial Reporting Fraud. 6 Motivations of Fraud Deterrence and the Transition to Investigation. 7 A Fraud Deterrence Professional’s Overview of the Legal Process. Basics of Opinion Testimony and the Role of the Judiciary. Expert Qualification Standards : When Is a Witness an “Expert”? Limitations on the Scope of Expert Opinion Testimony. Retaliation: The Newest Wave of Employment Litigation. Under the Fair Credit Reporting Act. Using a Third Party to Obtain “Consumer Reports." Disclosure to Applicant Regarding Consumer Reports. Disclosure to Employee Regarding Consumer Reports. Sample Notice of Intent to Obtain an Investigative. Sample Disclosure of Nature and Scope of Investigative. 9 Internal Control and Fraud Deterrence: The COSO Integrated Framework. 10 Recent Corporate Governance Reforms Enacted to Deter Financial Fraud. The Sarbanes-Oxley Act of 2002 and Related Rules and Regulations. Protections for Directors and Officers. 11 Generation-X Technologies and Information Assurance. Do We Need a Paradigm Shift in Systems Assurance and Auditing? Generation X Enterprise Technologies: State of the Art. Information Systems Integration: A Challenge. Assured Information Emanates from Assured Systems. Information Assurance: A Function of Strategic Importance. Various Information Assurance and Control Measures. British Standards: BS7799 and BS 7799-2:2002. System Security Engineering Capability Maturity Model: SSE-CMM. 13 Process and Information Validation. Part I: Interview and Interrogation Process. Difference between Interview and Interrogation. Structured Approach to the Interview and Interrogation. of a Suspect in a Fraud Investigation. Part II: Forensic Document and Handwriting Examination. Red Flags of Document Examination. Red Flags of Handwriting Identification. Identify Fraud Risk Indicators and Promote Business Intelligence. What to Look for in Data Analysis Technology. Function of Fraud Deterrence Reports. 16 Deterring Fraudulent Financial Reporting and Asset Misappropriation. 17 Fraud and the Bankruptcy Code. Bankruptcy Refuge for Fraudulent Actors. Application of Fraudulent Transfer Laws. Remedies for the Recovery of Fraudulent Transfers. Uniform Fraudulent Conveyance Act and Uniform Fraudulent Transfer Act. 11 U.S.C. § 548. Fraudulent Transfers and Obligations. 11 U.S.C. § 522 Exemptions. 11 U.S.C. § 101(31). Definitions. 18 Discovering and Preventing Fraud in Business Formation and Dissolution. Factors Affecting Whether the Fraud Will Succeed. Minimizing the Occurrence of Fraud. 19 Identity Theft and Privacy Protection. The Outbreak and Law Enforcement. Defend and Regain Your Identity. The Online Frontier of Phishing and Spoofing. How to Tell When Your Company Has Intellectual Property. 21 Fraud Deterrence in the U.S. Private Equity Finance System. U.S. Private Equity System and Its Governance Structure. Foundations of a Fraud Deterrence System in Private Equity. Adoption of Internal Control Systems within the U.S. Private Equity System. Shows how to deter fraud through internal control improvement within the structure of forensic accounting procedures. Provides extensive details on the practical applications and common pitfalls of forensic accounting services. Includes baseline forensic techniques and procedures and application of forensic techniques and procedures in specific situations. Explains the provisions of Sarbanes-Oxley that require management to perform positive procedures to understand their internal control structures and to more fully investigate allegations of wrongdoing. Includes tables, forms, and checklists related to forensic accounting, fraud deterrence, and fraud investigation.